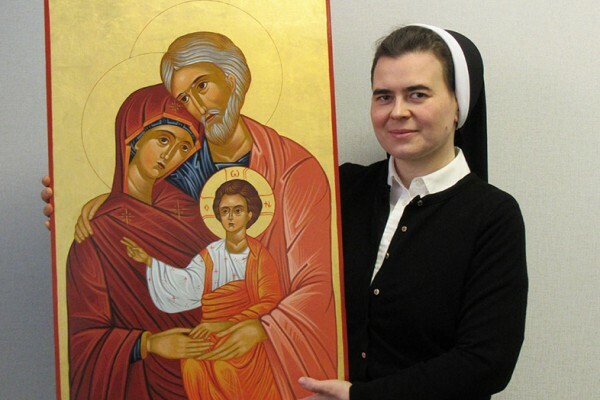 Editor’s Note: When Sr. Barbara Jean Wojnicki, Holy Family Province Superior, returned to her office after traveling for a few days, she found a glowing, golden icon next to her desk. The icon was painted by Sr. Hanna. This is a reflection from Sr. Hanna who created the sacred painting which now hangs in the provincialate. My adventure with iconography began several years ago when I attended several icon retreats with various iconographers. One of those retreats was led by Drazen Dupor, a Serbian iconographer, who studied the art of iconography in Greece. He encouraged me to continue this work and offered to teach me. It was then that the idea of a Holy Family icon came up. I have created several smaller icons over the years, but I am still at the beginning of this journey. For me the act of creating an icon is a time of reflection, prayer, slowing down, and distancing myself from the reality of a busy, hectic life. I am drawn to this unique art because of the theology of the icon and the spiritual process of it. The process of creating an icon is an analogy to our inner spiritual life. There are different stages in creating an icon, from the ground work of preparing a board through seeking an image (or a particular saint inviting us to that work), transmitting the image on the surface, choosing base colors, working on several layers of it, then mixing colors for the number of highlights and shadows of the image. The gold leaf comes at various stages, depending on the art school, and there are techniques to preserve it which must be followed. Then, the final layer of varnish is applied, and the icon is completed and blessed. As in life’s journey, there are mistakes along the way, some of which can be corrected and those that cannot be corrected, but can change us. As in our journey, we collect physical and emotional scars which wound us. So too, on the icon, some mistakes remain and they remind us that we are not perfect. The hope in this analogy is that the day will come when God, the Master, will put the final coat on his Holy Icons, which we are. His love will transform all of those scratches and scars, and we will shine. Sr. Hanna entered the Sisters of the Holy Family of Nazareth in August 1995. She currently serves as a spiritual care manager at Presence St. Francis Hospital in Evanston, IL.